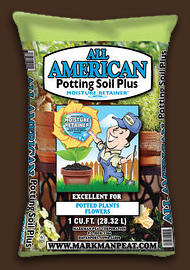 All American Potting Soil Plus Moisture Retainer™ is made from all natural soils and natural amendments that feed plants giving natural benefits to vegetables, perennials, annuals and herbs. PLUS it is enhanced with polymer crystals to help promote efficient watering. It is the perfect blend for all potted plants. Ingredients: This soil is formulated regionally from materials sourced from one or more of the following : Canadian sphagnum peat moss, processed pine bark, composted forest products and/or composted rice hulls, reed-sedge peat, ground dolomitic limestone (pH adjuster), fertilizer and Moisture Retainer™. Product may vary slightly from region to region. In Georgia: This product may contain 65-75% processed pine bark, Canadian sphagnum peat moss, composted forest products, limestone and fertilizer.